How to Read PDF on Kindle (Paperwhite and Fire Included)? Amazon Kindle plays an essential part in viewing files, enabling us to read all kinds of eBooks, personal or business documents with pleasing experience. While, PDF, for the reason of its high flexibility and portability, works as the standard document type for various files, even eBooks. And that is why more and more people have growing needs to read PDF on Kindle. Here in this article, we will introduce 4 different workarounds to read PDF on Kindle, no matter you are using Paperwhite or Fire, or other Kindle version. Still, you can expect more to work efficiently with Kindle. What if Your PDF Looks Weird on Kindle? How to Read PDF on Kindle? First of all, we need to know that Amazon Kindle supports reading PDF, which means, the key to read PDF on Kindle lies in adding your PDFs into Kindle for reading. To read PDF documents on Kindle, the first and indispensable step is importing the PDF to Kindle. Following are 5 options to save or transfer PDF to Kindle. A great part of Kindle readers prefer to add PDF to Kindle on a computer by connecting the Kindle device to computer via USB, traditional yet absolutely safe. Plug your Kindle to PC with the USB cable. Find the Kindle folder you want to add PDF to. Open the destination folder “Documents”, then drag and drop the PDF into the folder. Disconnect your Kindle from the PC. For windows users: right click on the Kindle drive icon on the bottom right and eject Amazon Kindle; Now, the PDF is now added to your ebook list for reading. This method is quite applicable for those feels comfortable to work on large-screen computers. It requires no Internet connection, you can even add a stack of PDFs to Kindle fast and effortlessly. There is a unique email address assigned to your Kindle device when you register for Kindle installation, and this email works like a hidden surprise to make files sending so convenient, whenever you are able to send out an email, you will able to read PDF on Kindle. Recognize your Kindle Email Address. Literally, the email address comes with a suffix @kindle.com. If you have never noticed this, go to Manage your Devices>Manage Your Kindle. Find the email address in Personal Document Settings. Add your personal email address to send email to Kindle. To prevent spam, Kindle allows only emails from approved email list. You will need to add your personal email address in Personal Document Settings. Send PDF to Kindle Email Address. Attach the PDF file in your Kindle-approved email and send to your Kindle email address. This works on any feasible emailing services. Wait for several minutes for your Kindle to sync. Once ready, you will find the PDF file appears in your Personal Documents library. This solution works even perfectly when you want to share some terrific PDF sources with other Kindle users. But here is the bummer of send-to-kindle by email: unstable Kindle server, you may fail to receive the PDF file or get it much later than you expect for a list of reasons. Download Send-to-Kindle App on Amazon. Install and launch the program on your computer. Login into your Amazon account. Drag and drop PDFs into the program. And click “Send to Kindle”. Wait for several minutes, you will find the PDF in your Personal Documents Library. Since this app covers an entire ecosystem, it is quite convenient for users who switch between different devices. With this app, Kindle users can greatly boost the productivity to read on Kindle, even work with Kindle. Tap the Menu icon on Home screen and tap “Experimental Browser option”. Tap the address bar to enter the URL of your PDF. Now, read PDF within Kindle browser. The main complaint about Kindle browser is the slow responsiveness, it will take a longer time to load PDF into the browser. Still, users are not in United State may have the problem to access to its browser for viewing online. Another benefit of using Kindle is its openness to install some other useful app on your Kindle device, such as Dropbox. Many of us benefit a lot from using Dropbox, it offers a central place to put file together and make the job to find or sync files efficiently. So, if you have a Dropbox account, you can read PDFs in your Dropbox on Kindle. Open Dropbox on your Kindle and tap Export. Choose “Save to SD Card” and locate the PDF file you want to add to Kindle. If you deal with files via Dropbox on a regular basis, it is indeed an good option to transfer your PDFs to Kindle for reading. It requires a stable Internet connection when transferring. You may have great chances to notice there are so many ebooks lovers exchange across different platforms, pursuing high-level reading experience. And according to below, the PDF reading on Kindle is not always, that satisfactory. PDF doesn’t support enough information to reflow the content. That’s why your PDF won’t fit automatically for reading on Kindle. You cannot change the layout, font size, line space etc. When you zoom in a PDF, the text won’t reflow, you can only see a zoomed view of the section on your kindle screen. PDF is rich in elements. In addition to plain text, PDF includes a wide range of elements, such as tables, images and other multi-media parts. But Kindle isn’t good at rendering these elements well, especially images. If you PDF is image-based, let’s say scanned, the content even may not appear. What to Do? Get your PDF to Kindle-friendly format! So, you can choose to read a PDF in another format on your Kindle Paperwhite or Fire. To achieve this, you may need a PDF to Kindle converter, but the choice will depend on which operating system you are using. Cisdem PDF Converter OCR for Mac, according to its performance and features, is a top choice for mac users who want to convert PDF to Kindle format. It is a mac program allowing users to convert any PDF (native and scanned) into Kindle format, such as PDF to Word, HTML, Image, RTF, even to other popular formats, like ePub, Keynote, Excel, Powerpoint, Pages, Text, etc. Converting while retaining the original file quality is the reason Cisdem substantially beats its competitors. Download the free trial of Cisdem PDF Converter OCR, install and launch. 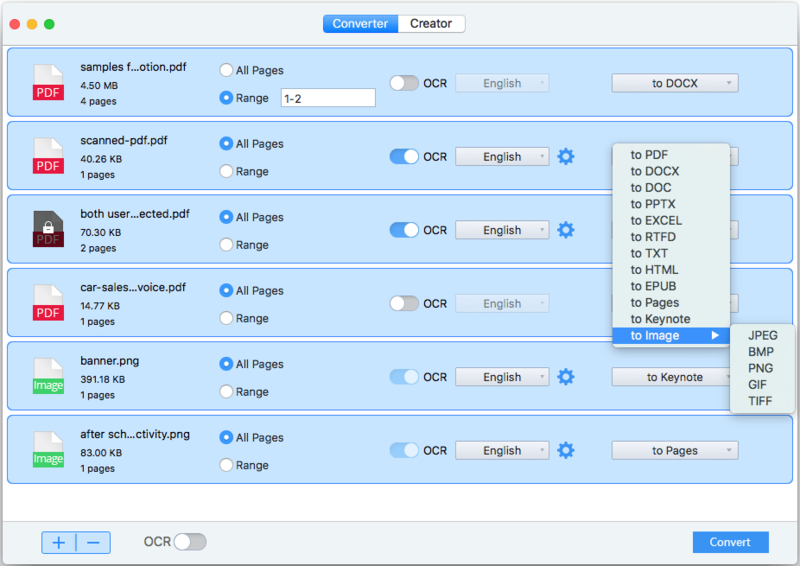 Drag and drop PDF files into the program, batch conversion is supported. Choose output as any Kindle supported format. If you just want to read partial pages on kindle, fill a page range in the filed. Click “Convert” to change PDF to Kindle format on mac. Foxit PhantomPDF, though boasts itself in PDF editing with completive price, it is also a powerful PDF Converter to export PDF as many Kindle format, such as Word, RTF, HTML and image. It is adequate for users who want to read PDF on kindle after a customizable editing, also for those who cope with PDFs very often. Choose a Kindle format and specify your output folder. Once the Kindle file is generated, save it. It is not that tricky to read PDF on Kindle now that PDF works as a Kindle-supported format. And for sure, there are more choices out there can make this. But if you go for a comfortable PDF reading, you may finally come to a PDF conversion, in this case, solve this by trying our recommended solutions, just as many other users do.